We’d love your help. Let us know what’s wrong with this preview of Auntie Claus by Elise Primavera. Auntie Claus is just another eccentric New Yorker--or is she? Young Sophie has often wondered about her unusual great-aunt, Auntie Claus. She lives in penthouse 25C at the Bing Cherry Hotel and is so curioso! After all, Auntie Claus serves Christmas cookies all year long and her tree is always the best-decorated in the city. And then there's her annual "business trip," right around the holidays. This year Sophie is determined to get to the bottom of Auntie Claus's mysterious ways. Put on your mittens and bundle up for an adventure beyond your wildest dreams. Ho, ho, ho! To ask other readers questions about Auntie Claus, please sign up. Confession; I got this book because it has Auntie in the title and I thought it would be fun to read an Auntie book to the children. It's a cute book with colorful artwork. I enjoy the fashions depicted and the perspectives given. The story is about the Claus family who live in NYC in a nice building. The aunt is mysterious and she disappears from Halloween to Valentines day on 'Business'. Sophie decides to find out what is going on. 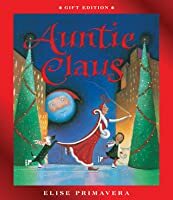 She find the aunt is the sister of Santa, so she helps out for Confession; I got this book because it has Auntie in the title and I thought it would be fun to read an Auntie book to the children. She find the aunt is the sister of Santa, so she helps out for the Christmas season - big surprise right. Anyway, Sophie learns lessons on the importance of giving. I think she's been inducted into the family business too. Cute story about Auntie Claus, Santa's sister, and how she teaches a lesson to her little niece. Very colorful. Kids love it. I read that this was an excellent Christmas story for children. I am always looking for great books to give as gifts. I like it, but don't love it. I'll keep looking. This was a popular book at the school book fair and when our oldest asked me to read it to her and a few classmates during reading time in her Second grade class, I was more than delighted to. It was a bit of a disappointment for me, however. The story seemed to be disjointed and too long and the message was all but lost. It just didn't flow well for me, although if I read it again, I would probably adopt a few different accents. The kids seemed to like it, but I just thought it was okay. The il This was a popular book at the school book fair and when our oldest asked me to read it to her and a few classmates during reading time in her Second grade class, I was more than delighted to. It was a bit of a disappointment for me, however. The story seemed to be disjointed and too long and the message was all but lost. It just didn't flow well for me, although if I read it again, I would probably adopt a few different accents. The kids seemed to like it, but I just thought it was okay. The illustrations are great and the overall message that it is better to give than receive is a good one. A classic tale that teaches the path to happiness that invites us to live the true meaning of Christmas, love, throughout the year. Christmas is not about what you get or how many gifts you are given but it is about giving of yourself to others, "it is far better to give than to receive". Because "all the best things in life are invisible". 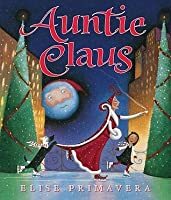 Auntie Claus is a Christmas themed children's book about Santa Claus' sister written by Elise Primavera. It follows the story of a greedy and spoiled young girl named Sophie, who lives with her family in New York City. Sophie is curious about her great aunt, Auntie Claus and thinks that something is different about her; not only does she love Christmas more than anyone else, but she also often goes on mysterious business trips. Sophie decides to hide in her aunt's luggage and ends up in the Nort Auntie Claus is a Christmas themed children's book about Santa Claus' sister written by Elise Primavera. It follows the story of a greedy and spoiled young girl named Sophie, who lives with her family in New York City. Sophie is curious about her great aunt, Auntie Claus and thinks that something is different about her; not only does she love Christmas more than anyone else, but she also often goes on mysterious business trips. Sophie decides to hide in her aunt's luggage and ends up in the North Pole, where she discovers that her aunt is the sister of Santa Claus himself. She goes on a wild adventure disguising herself as an elf, discovering her brother is on the naughty list (and trying to change that), and ends up on the stage at the North Pole with her Aunt and Santa Claus on Christmas Eve, right before he is about to deliver presents. She ends up safely at home on Christmas morning with her family after having discovered the meaning of Christmas, the once greedy and selfish Sophie discovers that it is "far better to give than to receive." I consider myself a "professional aunt", doting on my 8 nieces and nephews over the years and now doting on their children. My ex-SIL pointed this book out to me which prompted me to give it as a gift this year. Of course, I had to read it before sending it off. I loved this tale of the elegant, eccentric sister of Santa who goes on a "business trip" every year from Halloween to Valentine's Day. We can guess where she goes, but her niece Sophie is determined to find out by stowing away in Auntie I consider myself a "professional aunt", doting on my 8 nieces and nephews over the years and now doting on their children. My ex-SIL pointed this book out to me which prompted me to give it as a gift this year. Of course, I had to read it before sending it off. I loved this tale of the elegant, eccentric sister of Santa who goes on a "business trip" every year from Halloween to Valentine's Day. We can guess where she goes, but her niece Sophie is determined to find out by stowing away in Auntie's luggage one year. She has the experience of a lifetime at The North Pole and learns a wonderful lesson about giving and receiving. This is a fun story. The story is imaginatively told and illustrated. The elements of Auntie Claus' lessons are laid out subtly, but obvious in the end. It artfully weaves the spiritual essence of the holiday with its secular presentation. The narrative is descriptive and wholly necessary, but wordier than what our preschooler is used to. When we read this in the afternoon, we had our preschooler's undivided attention. S/He didn't want to sit still for it at bedtime, though. Every time we read it This is a fun story. The story is imaginatively told and illustrated. The elements of Auntie Claus' lessons are laid out subtly, but obvious in the end. It artfully weaves the spiritual essence of the holiday with its secular presentation. The narrative is descriptive and wholly necessary, but wordier than what our preschooler is used to. When we read this in the afternoon, we had our preschooler's undivided attention. S/He didn't want to sit still for it at bedtime, though. Every time we read it, s/he wants to know more about Sophie and Auntie Claus. This was a fantastic gift for a New Yorker Auntie to give her godchild at Christmas. 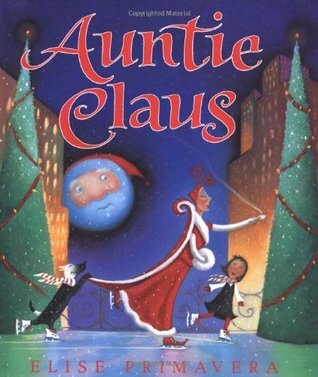 Sophie has always been curious about her rather eccentric great-aunt who lives in New York, Auntie Claus. She always has the best tree, she serves Christmas cookies all year round, and she always seems to take a mysterious "business trip" around the holidays. This year, Sophie's determined to find out what's going on, so she stows away in Auntie Claus's luggage. The illustrations are really beautiful and we had a This was a fantastic gift for a New Yorker Auntie to give her godchild at Christmas. No other Christmas book has captured the imagination of my daughters like this one. They wondered if they might be on the list for bad children and were intrigued by how Santa (apparently) gets things done. They were so fascinated by Auntie Claus that one of my daughters even asked Santa in her Christmas letter if his wife was called Auntie Claus! The illustrations are fantastic too. This book has remained a firm favourite over several years now. Loved, loved, loved this book. This is going to become a staple in my Christmas collection. Sophie's "never enough" attitude meets Auntie Claus's "Whether it's birthdays, Christmas or Halloween, it is far better to give than to receive" attitude in this tale where Sophie investigates where her Auntie Claus goes every Halloween through Valentine's Day and discovers that there is more to her great aunt that meets the eye. I really liked this book. I thought it was very cute. Plus I love Christmas so you can't really go wrong. I thought the message of the book was very well delivered. I did think it felt a little bit long my little cousin lost interest pretty quick in, but I think as he gets older he will be more interested in it. I could see this being a favorite to read in the month of December. Thanks for spreading a little magic. May we all give more than we receive. This is the story of Santa's sister and niece. Sophie follows her Auntie Claus to the North Pole to see what business she is in. Sophie learns that her Aunt is actually Santa's sister. She learns the lesson that it is better to give than to receive. I would not say this is my favorite Christmas story. However, I do love Christmas, so I would have this book in my classroom. It also has a good message about learning to give rather than receive. I really liked this book. I thought it was very cute. Plus I love Christmas so you can't really go wrong. I thought the message of the book was very well delivered. I did think it felt a little bit long my little cousin lost interest pretty quick in, but I think as he gets older he will be more interested in it. I could see this being a favorite to read in the month of December. May we all give more than we receive. 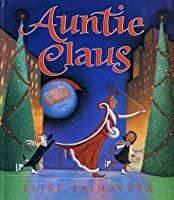 Auntie Claus is a fun Holiday book for children to see the mystery of Santa. The illustrations are colorful and fun. 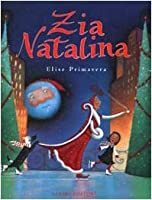 The story is a fun twist on the original tale of Santa Claus, this story has a little girls great aunt who goes on vacation around Christmas each year. The story didn't flow well to me and lost me so it may be confusing for children. This is a great holiday story about giving. It is nice because it is set in modern day, without Santa as the main character. It is about a spoiled little girl that learns about giving. It is ideal for elementary age students, although I enjoyed it myself at 20. It was okay. The "message" that 'it is far better to give than it is to receive' got a little lost, I think. Things didn't really flow or click for me. Overall, fun story - maybe a little long, so be aware of attention spans; fun illustrations; sweet but glossed over message. This is a charming take on the Claus Family story and the age old ‘giving is better than receiving’ lesson. It’s great but not my favourite - I feel this might be a bit long and could do with one more edit. Magical, amusing and fun! Big, bold illustrations and a mysterious version of the Santa Claus family with a nice moral lesson for the kiddos. My four year old enjoyed this one and the sequel very much. A fun Christmas story. Sophie has always wondered why her aunt is gone for several months at a time during the year, so this year she decides to sneak along and find out. What will she discover when she realizes where her aunt goes every year? What is the family secret? I adore this book, have read it every christmas since it came out. it is so wonderful to read to kids!